TV advertising objectives include product and service sales, web site traffic, brand and product awareness, image building, generating sales leads, public relations. Product and Service Sales - communicate offers that directly generate orders. Web Site Traffic - Get people to visit your web page(s) who may perform specific actions such as subscribe to a service. Brand and Product Awareness - Help viewers to understand their need or desire for a product and let them know a solution is available. Sales Leads - Want people to go to places to submit their names and other information that identifies how they are qualified candidates for sales efforts. Public Relations - Communication of information that is of public interest. Some regulations require companies to communicate information to the general public. 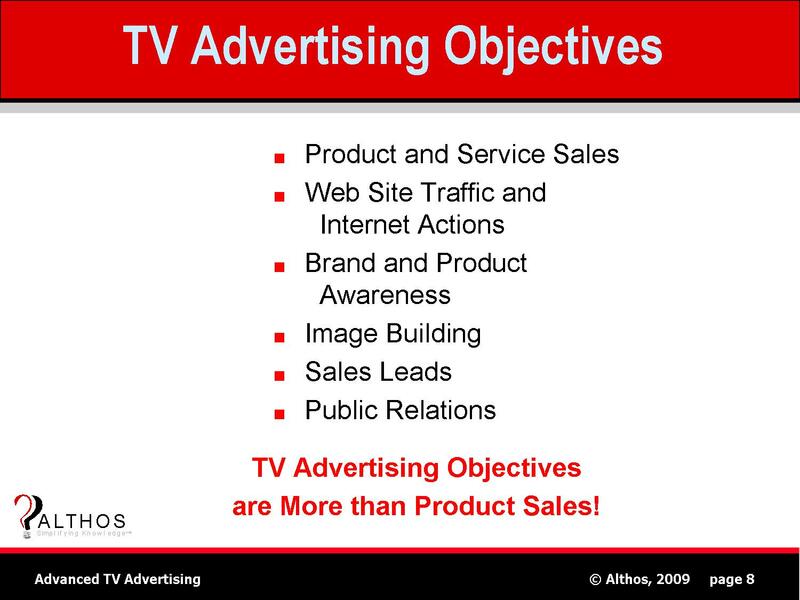 TV Advertising Objectives are usually more than product sales!